The name canadice is said to mean "long lake." This is a bit strange since the lake is only 3.2 mi./5.15 km. long, making it the smallest of the Finger Lakes. Canadice Lake covers about 850 acres. It is 1,300 ft./396 m. wide with a maximum depth is 95 ft./29 m. At 1,096 ft./334 m. above sea level, it is the highest of the Finger Lakes. Along with Hemlock Lake, Canadice supplies water to the City of Rochester. 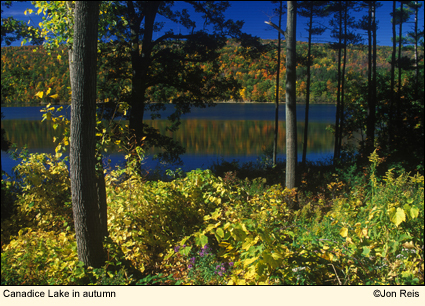 Approximately 7,100 acres around the two lakes are owned by the State of New York with the City of Rochester operating as the lakes' steward. The fact that the lake is a water source for the City of Rochester has meant that lakeshore development that occurs on most lakes hasn't occurred here. Instead, the steep, unbroken, wooded lakeshore provides a beauty and restfulness usually found in more remote areas. The trails are suitable for biking, hiking, skiing, and snowshoeing. The area abounds in wildlife and can be an excellent spot to watch birds, especially during migration. See more information about the trails around Canadice Lake. The hills around the lake break the wind and provide boaters with generally calm water. But when the wind picks up, the water on this small lake can become rough. At this time, paddling becomes much more difficult. To avoid the wind, try night paddling by the light of the moon. Your trip around the lake should take about 4 hours. East side of lake on Canadice Lake Rd. south of intersection of Burch Hill Rd. Parking for 20 vehicles. Brochure. 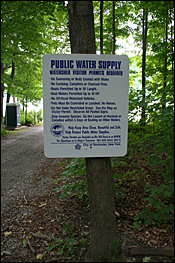 This brochure lists all permitted and prohibited activities and provides a detailed map indicating trails, boat launch sites, roads, and restricted areas. There are no facilities around Canadice Lake; however, Hemlock Lake Park, the location of which is indicated on the map, has restrooms and a picnic area. City of Rochester employees patrol both lakes and the land around the lakes, which is posted, even on Sundays and holidays.